You finally get up the guts to open your own business. You hang up your shingle, ready for the flocks of customers who will be thrilled to buy from you. Successful businesses have customers marching through their (sometimes virtual) doors to give them money. It’s a simple concept, but can be harder to achieve in reality. How do you attract more customers to your business? How do you get more people to think of your products and services at the exact time they’re ready to buy? This is Part 1 of a 2 part series in attracting more customers to your business. 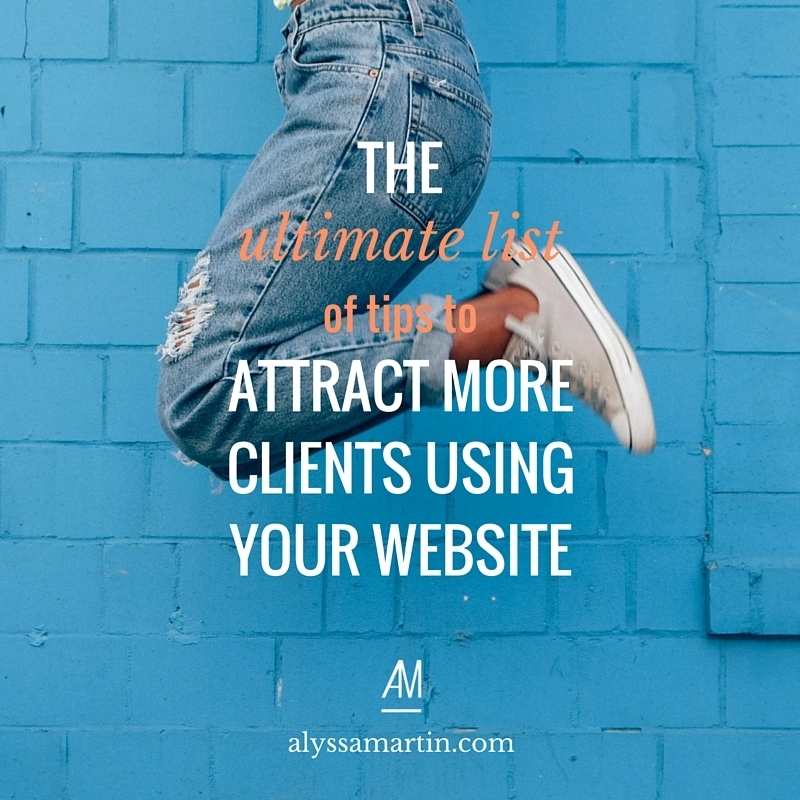 All together, these 2 blog posts will make up the ultimate list of tips to attract more clients to your business. Because your customers are online. Over 2.2 billion people are online worldwide. So, it’s no surprise that small businesses with websites have an average of 39% more revenue per year than those without websites (according to the US Small Business Administration). Because it establishes credibility. When we can’t find a company website it raises lots of questions. Does this company really exist? How legit are they? Can I trust them? People don’t think you really exist unless you have a website. Twice in the past week I’ve wanted to do business with someone, only to find they didn’t have a website and changed my mind. One was a lawyer, the other was a lawn mower guy. It doesn’t matter how big or little the investment in your services is, having no website is often a big deal breaker. In fact, 58% of global online consumers said they’re more likely to trust a company with “owned media,” like a website, versus one who doesn’t (Nielsen Advertising Survey, 2012). In other words, if you don’t have a website, you’re probably being overlooked by 58% of your potential clients. What’s a meta description, you ask? It’s the little descriptive snippet that appears under your URL in a Google search. The goal is for it to be an enticing description that the searcher wants to click on to find out more. Ultimately, it’s one important way that you can turn an average Google searcher into a website visitor. It represents the first touchpoint between your brand & the world. The average person has an 8 second attention span… compared to a 9 second attention span for goldfish (National Center for Biotechnology Information, U.S. National Library of Medicine, The Associated Press). One top of that, the average page visit lasts a little less than a minute. That means when someone lands on a page on your website, they probably only stay on that same page for 60 seconds or less. So, make sure that when a visitor lands on your site, they know what you do, what kind of site they’ve landed on, if your site is made for them. Think about times in real life when you say, “welcome.” It’s always when you’ve already got someone’s attention. When they’ve just walked through the front door of your house. When you’ve just shushed a crowd to start your speech / event. On your website, you don’t already have your audience’s attention yet. That gives them everything they need to know. “I’m Paul Jarvis [who you are]. That’s how you get attention from the minute they land on your site. 4. Know your customers. Intimately. Everything you do should be in the best interests of your customer. That means you need to have a detailed understanding of their needs, wants, problems, hopes, dreams and day to day life. You need to understand where they’re at right now. What is keeping them stuck? What is causing fear or holding them back? How does that manifest in their daily life? Or, what aspirations do they hold for themselves? Where do they really want to be? What would her life look like if that problem was solved for her? Talk to them. Find out who they are, what they struggle with, how you can help them. The more you can see your potential customers as real people (not just people that you kinda sorta hope exist), the better you will be able to meet their needs and make them happy. And happy customers refer other likeminded people to your business that will probably enjoy working with you just as much as your existing customers..
We use the internet because it’s fast & easy. When your site navigation doesn’t meet the ‘fast and easy’ criteria, then your visitors click away to another site that is easier to use. If you don’t give them what they want straight away, they’ll get sidetracked by remembering to hang the washing on the line or screaming children or they’ll find a website that is easier to use. You need clear and simple website navigation. If you offer trainings & courses, don’t hide that behind a page called “More Info.” Your visitors won’t know what to expect when they click on that page, so they won’t bother clicking at all. Don’t let your poor website navigation help other people land customers. Keep it simple. I saw a Work with Me page recently that had decent copy on it… except that it didn’t outline the next steps to working together. I didn’t know how to buy, so I bought nothing. If you want your customers to visit your bricks and mortar store, tell them that. If you want them to buy from your online store, link to the relevant page on your site. If you want them to email you directly, tell them that and tell them exactly what they need to tell you so that you can suitably answer their enquiry. Perhaps most importantly, use the squint test. Look at the page where your customer goes to buy / pay you. Can you easily find the payment button while squinting? If no, it’s the wrong size and/or colour. And make sure the button colour is different from your regular brand colours. Red or orange are especially good colours for converting friendly window shoppers into happy, paying customers. I recently went to get my hair cut at a new hairdresser. Afterwards, I got a plastic card with a barcode on it, like a credit card. It was registered to my name & my account at the hairdresser. Then, I also got 2 extra cards each with a $20 voucher on them – these were for me to give to other people and were also linked to my name. So, when my friends uses their referral card, she gets $20 off & the computer pings and recognises that I’m the one that referred her and credits $20 to my account too. Not only did they give me a reward for referring people, they made it really easy for me to do it. The next time I saw my sister, you bet she got a referral tag. But how do you implement something like this for your own business? That way your clients know from the beginning that they should be thinking about other people to refer to you because they’ll be rewarded for it. For this to work though, you need to clarify what kind of gifts you’re willing and able to offer. You don’t want people asking for a flight to Paris so offer some examples: a bottle of wine, Amazon voucher, Starbucks card, a gift certificate for their favourite store, etc. It sets the expectation that you want referrals if they’re happy with your work and lets your customers know that there’s a reward if they give you one. Referral gifts are a great addition to your business. I recently got a referral from Evan Leah Quinn. And since I read her blog, I know she’s a fan of Super Love Tees. So I bought her a gift voucher out of the blue to say thanks – and it made both of us feel really good. She was happy; I was happy that I made her happy. Real people that you want to serve hang out on these networks everyday. The question is: which network do your dream clients hang out on the most? My audience is women entrepreneurs and Pinterest has a huuuuge percentage of women in their social media network. So, I learned what makes a pinnable image and tailored my blog post images to match that. It’s now where most of my traffic comes from. You don’t need to master EVERY social media platform. Just find 2 or 3 that your customers use most and that you enjoy using to connect with those customers, then stick with those. If you hate using one of those platforms, it won’t work for you because you won’t put the energy into making it work. You’ll be resentfully dragging your heels every time you log on. Personally, I hate Facebook with a fiery passion. So… I don’t use it. Controversial, I know. But, guess what? I miraculously still have a business & I still find clients.